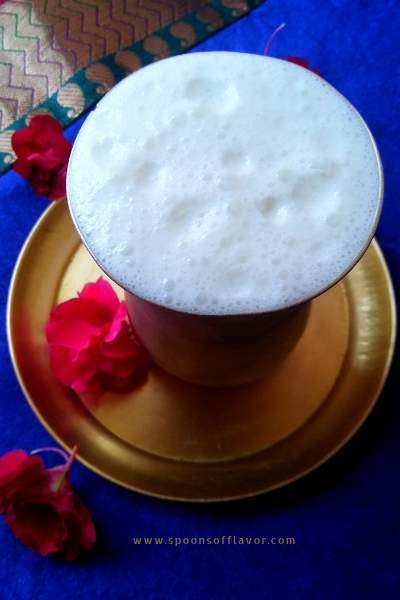 Plain sweet lassi – A basic iconic lassi recipe. Which is light and ridiculously simple to make. Yogurt is the main ingredient of this drink. Nothing like a chilled glass of frothy sweet lassi to cool down a hot summer day. Lassi is a cooling and refreshing yogurt-based age-old summer drink originated in the Punjab region of India. Traditionally lassi is made with fresh homemade curd and sugar by churning with a wooden hand blender or ‘Madani’. Then served in earthen pots or tall brassware glasses. Though there are many flavors and variations of lassi available. To enhance the flavor, additional flavors are also added like cardamom powder, saffron, and rose syrup. But this classic one has its own charm. Prevents stomach problems like bloating. It is a good source of probiotic. 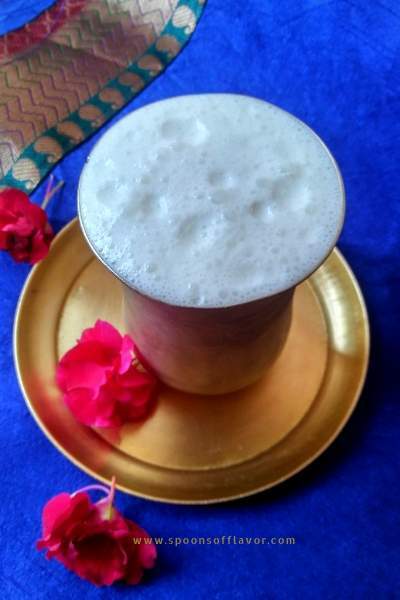 To make this classic Indian lassi recipe I have used yogurt, milk, sugar and ice cubes. You can also use water instead of milk. If you want a thin lassi just add more milk or water. I want to make it light. Hence I have not added malai here. But the using of malai really makes the drink more drool-worthy. 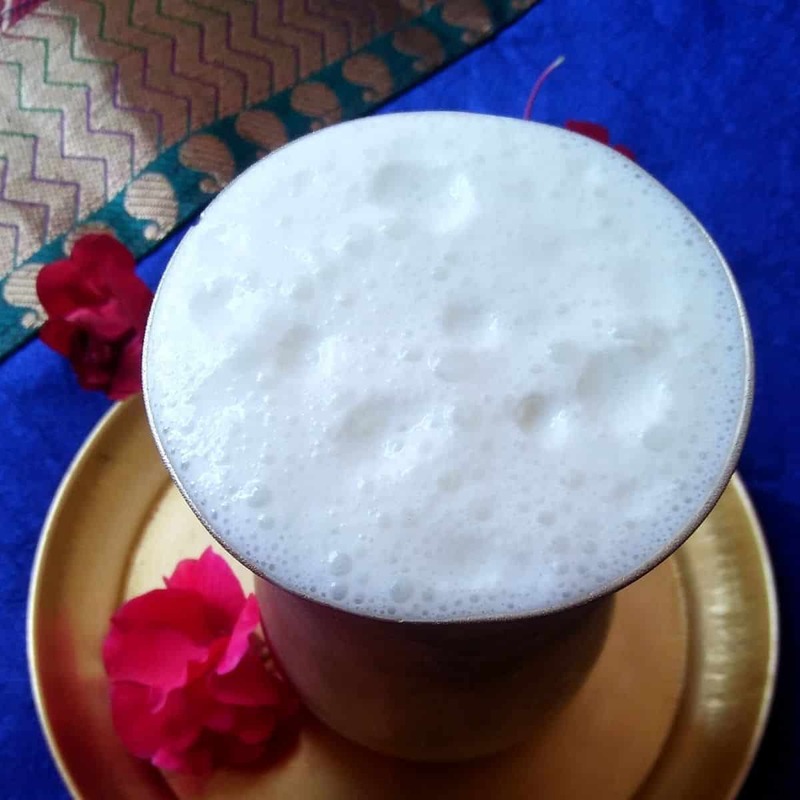 Let me know your thoughts about this plain sweet lassi recipe in the comment section. Also, you can connect with me on Instagram, Facebook, Pinterest, and Twitter. Plain sweet lassi is a basic light lassi recipe. Which is ridiculously simple to make. Nothing like a chilled glass of frothy sweet lassi to cool down a hot summer day. Beat the yogurt in a bowl until smooth. In the same blending jar combine yogurt, milk, and sugar together. Then blend for 2 minutes or until mixture becomes frothy. If you are using the wooden homemade blender, churn all the ingredients together except malai until you see a frothy layer on top. Plain sweet lassi is ready to serve. Pour lassi into the serving glass from a height to create foams. Then add a dollop of malai on top and serve. This sweet lassi recipe is contributed to the facebook group Healthy Wellthy Cusines for the theme ‘Lassi Masti’. Below are the contributions of other members. The Lassi and the presentation, everything is bang on. You are absolutely right Geetanjali , nothing can beat the charm of classic lassi! Easy to make and perfect summer coolant!